My name is Luis Galmez,I have 20 years old and I came from Chile. A few weeks ago I get my first Ford T of the year 1926 and i started to fix it by my own. last week fix the engine an made it run after the car was stop for over 15 year ago. It works excellent!!! in the last weekend a dad`s friend gift me a coil tester but it dosn't work. (view picture at the end) so I need help to restore this coil tester to make it work. Someone know about it? how it work and someone have a guide or instruction about this coil tester? I found a similar coil tester picture on internet that it is very similar to my own. Luis, tu ingl�s es mejor que lo de Google. Please contact me and I will send you a wiring diagram and answer any questions that I can. Ron Patterson restored the tester in the photo. He has restored dozens and could answer your questions as well. 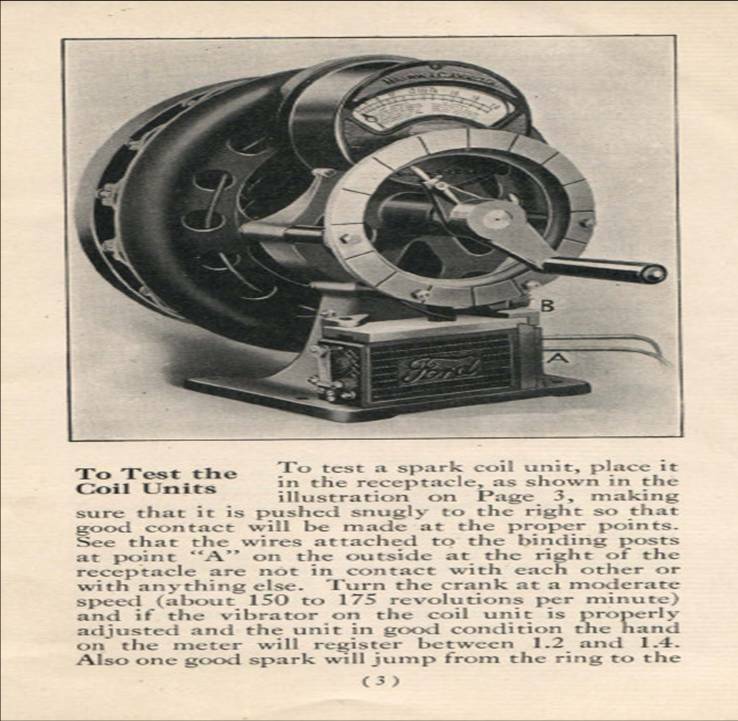 If that doesn�t provide the information you need recommend you look at the plans for building a Hand Cranked Coil Tester (often called HCCT on the forum). Thank you to Gary Tillstrom for making those available. and there are other related threads. And be sure the car is in safe working order. An engine that burns oil is not a critical safety issue (at least not in my book) but the front end castor if it is set up negative can flip the car. If the rear axle still has the original babbit thrust washers you can lose your normal service brake. Those and similar items are well documented "oops" for the T. But if you have never been around one -- they are probably new "data points" for you. Some of them are listed below � not to scare you but to let you learn from others rather than discovering all the lessons on your own. Use safety wire and not lock washers or cotter pins on the two studs holding the wishbone to the underside of the engine. Even with a perfectly good and properly adjusted front steering system � if you back up quickly, the front wheels can go full left or full right and pull the steering wheel out of your hand � so remember to back up slowly. It is caused by the caster of the front wheels similar to the casters on the front of the shopping cart � designed to be stable in one direction but not so stable in the opposite direction. Since you have already been driving the car you probably do not have the following problem � but you might still want to check. If someone rebuilt the front axle and it is was really difficult to keep the car going straight they may have inadvertently swapped the front spring perches. There is a left and a right spring perch that tilts the axle so the bottom of the axle is slightly ahead of the top of the axle (5 1/2 degrees positive caster � although there is some discussion that it is a little less but still positive for the balloon tires like you have). If it has negative to neutral caster it can cause a wild ride and also could cause the car to flip even at a slow speed see: http://www.mtfca.com/discus/messages/80257/80333.html?1233523419 that shows the spring perch installed incorrectly and how the front axle looks then. 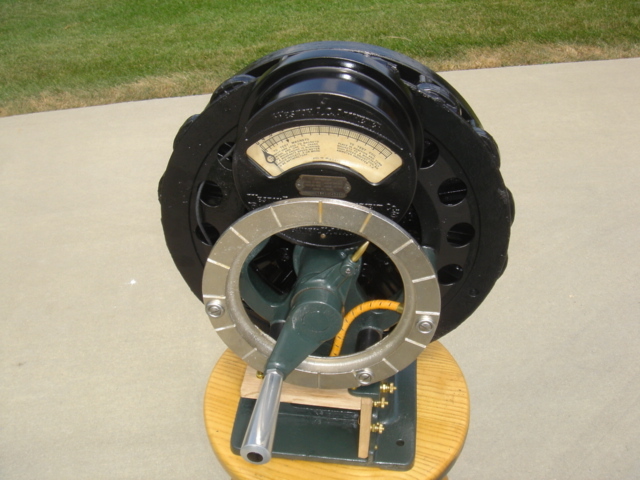 Also see: http://www.mtfca.com/discus/messages/29/40382.html Note even with the spring perch installed correctly a bent or shortened wishbone could cause neutral to negative caster. The Model T is a faithful servant but it has some known issues that the driver needs to be aware of and to take proper precautions about. Again welcome to the forum and the hobby. Thanks Mark. Sometimes the photo looks "ok" in PowerPoint but looks distorted when I paste it somewhere else. Thanks for setting it straight. If the meter needs any repairs or calibration, I can help. I repair and calibrate coil tester meters - both Weston and Jewell. If you have any questions about the meter, please do not hesitate to ask. If you want to know how I go with my project check in this post.